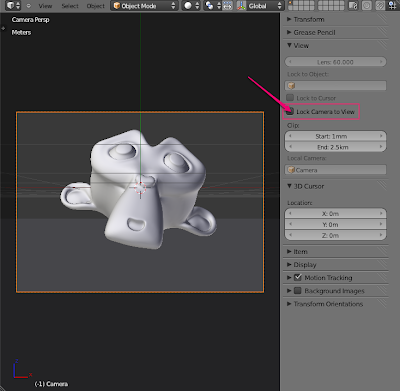 In this quick tip, I'd like to explain a little Blender feature that apparently is not widely used. I find it incredibly powerful, to the extent that I think it should be the default behavior. 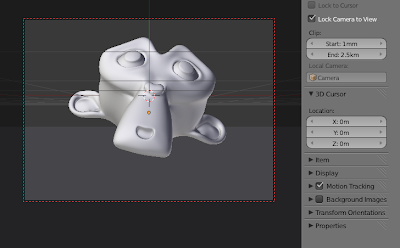 Oftentimes, while watching other people's workflow in Blender, I get the impression that the most common way to frame a shot is by going into Camera view, selecting the camera itself, pressing G or R, plus a specific key for each axis (X, Y, Z) in order to move or rotate the camera itself. Alternatively, one can press Shift-F to go into Fly Navigation mode. However, I really never liked Fly Navigation mode. I find it hard to control. Neither of these methods is, in my opinion, great. There is a third way that lets you fine tune the position of the camera intuitively—without leaving Camera view. In order to access this option, you need to press N with the pointer in the 3D View to access the Properties side panel. Then, under the View tab, click on the Lock Camera to View option to activate it. Click on Lock to Camera View to activate this option. Once you select that option, make sure you're in Camera view. You'll notice that the camera limits become red, indicating that your camera is ‘locked to the view’. 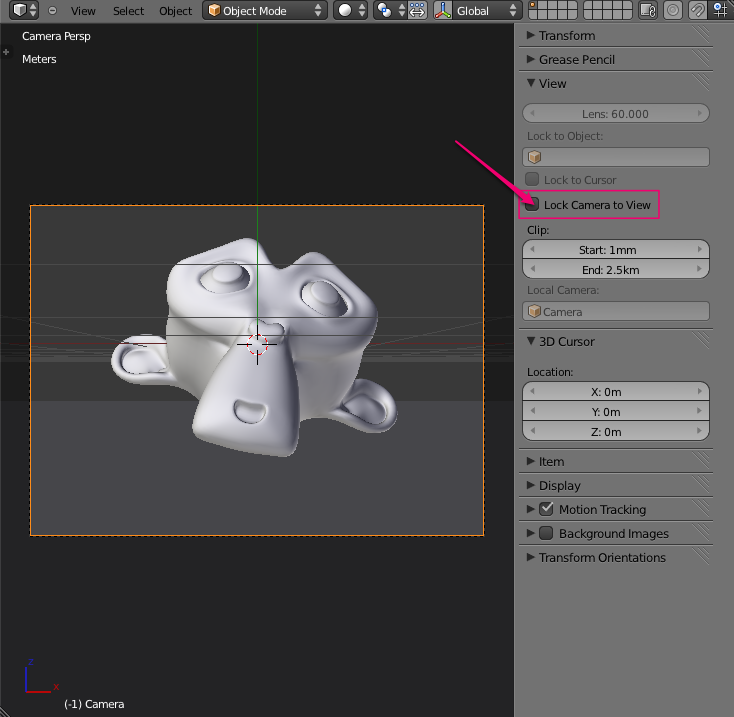 Go ahead and use the navigational shortcuts you would use in any other view mode (defined on the Input panel in the Blender Preferences dialog) to move around in Camera mode and frame the shot precisely. You can now zoom, orbit, and pan the same way you‘d do in other views, and the camera adjusts accordingly. Cool stuff. the camera in order for this to work. Note: Once you're happy with the framing, you could deselect the Lock Camera to View option so that you don't change the shot composition accidentally. Hah! Now that's so much more easier then panning and rotating and panning and rotating the camera again and again to get the right view for rendering. Thanks! Except that shift-wheel ctrl-wheel do not work as in non-camera mode. Bug? THANK YOU SO MUCH! You made my day! I did this one time with my teacher, then I forgot how I've done it, Today I was looking for this explanation for HOURS! Press Ctrl+Alt+0 (of the numpad) and you have the Camera right in the angle and position of your view. you can change the Camera with Ctrl+0 so you can view from the lamp for example. Well this is an amazing improvement! WHY IS IT NOT LIKE THIS BY DEFAULT?!?!?!?! That was NOT caps lock, I was actually screaming there. For years and years the first thing I do is delete the camera (always) and the default cube (unless i want a cube for whatever reason) because they are in my way, you have just changed that rather dramatically. Its things like not knowing this and not knowing how to find out that drive new users and even some old users insane. If the world ran on beer instead of money I would owe you enough to destroy your liver five hundred times. Thank you. Great tip for who is just starting with blender!! You're my hero. Until I read this, I thought the camera positioning in Blender made the program unusable. Andreu, thanks so much for sharing this tip! Very useful, indeed. This is the Blender tip to end all Blender tips. I've always wanted a way to easily render from the view using normal nav controls. The workflow is so much smoother now. Great post! Thank you for sharing valuable information. Keep up the good work.. Thank you so much. Its so simple, but saves me hours!!! I owe you lunch or at least a cup of coffee!!!!!! Thanks I owe you lunch or at least a cup of coffee!!! Thanks a lot. Really useful.